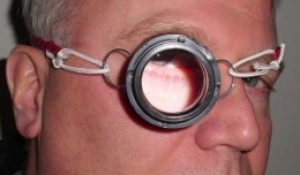 Homemade magnifying monocle intended to facilitate fine-pitch electronics work. Constructed from a magnifying lens, a pipe coupler, keyrings, elastic cord, and a sunglasses strap. Haha. Dorky, yes. But I've found the need for one at times and this is a cheap way to do it.